MEDFORD -- By finishing among the top 35 at the 2009 NCAA Division III Men's Cross Country Championship New England Qualifier on Saturday (Nov. 14), four Tufts Jumbos earned U.S. Track & Field/Cross Country Coaches Association (USTFCCCA) All-Regional recognition. The regional championship was held at the Twin Brook Recreation Center in Cumberland, Maine on a rainy afternoon. 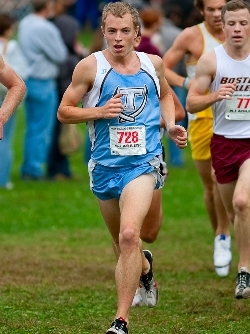 Tufts senior Jesse Faller (Burlington, MA) was fourth overall on the 8,000-meter course with a 25:26.8 time. Freshman Kyle Marks (Carmel, IN) posted a time of 26:06.3 for 23rd place. Junior Jeff Ragazzini (Wilton, CT) finished 29th in 26:11.2, while junior Chris Brunnquell (Harrington, NJ) took the last All-Region spot in 35th place (26:20.3). The race featured 321 runners overall. Faller qualified to race individually at the 2009 NCAA Division III Championship in Cleveland next Saturday (Nov. 21). Tufts played eighth as a team out of 48 at the regional championship.